On September 14, the Oregon Secretary of State's office released its long awaited audit of the Smarter Balanced Assessment, as required by House Bill 2713. The audit appears to have relied heavily on information provided by the Oregon Department of Education and no serious effort at asking school districts to report their actual expenditures of time and money appears to have been made. 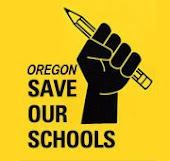 A member of Eugene Citizens Alliance for Public Education (CAPE) has written a letter to the members of the Oregon House and Senate Education Committees which we share here. We urge you to write letters to these committees in the House and Senate as well as your own state representatives. Watch for more to come from CAPE, Oregon Save Our Schools, and other grassroots organizations regarding concerns with the audit. Find the audit itself here. The results of the so-called audit of Oregon's standardized tests are bogus. The ODE's report does not fulfill the purpose of House Bill 2713. 1. 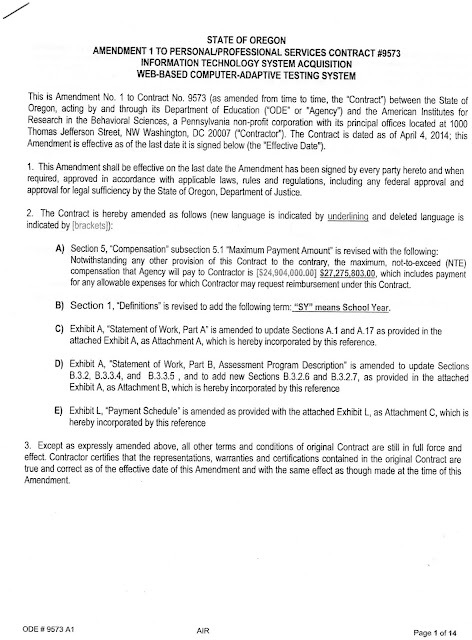 Contrary to the report, the state spent $27,275,803 on Smarter Balanced in July 2014, according to its contract titled "State of Oregon Amendment 1 to Personal/Professional Services Contract #9573 Information Technology System Acquisition Web-Based Computer-Adaptive Testing System". Yet the audit claims spending less than $11 million. 2. No one can find a district that was asked to record all its own expenditures, such as new or updated computers, increased bandwidth, extra substitute teachers, additional testing coordinators, etc. Instead, the audit relied on vague generalities. It should be easy to compare expenditures before and after Smarter Balanced testing began with regard to specifics like hiring substitute teachers, etc. 3. "Boots on the ground" experiences were not taken seriously enough. The tables for test length are taken straight from SBAC manuals without noting that teachers consistently report test administration requiring 10-12 hours, as well as fifteen or more hours for SPED and ELL students. SBAC's own manuals state that their time tables don't include individual log-in, breaks, re-booting and various snafus. 4. This "audit" admits to not addressing issues of content. Yet the quality of test content should be of supreme importance! They don't address that juniors are tested on college level material or that third-graders are asked questions appropriate for middle-school. Note: analyzing online sample materials should avoid any copyright infringement. SBAC itself ranks this passage from the National Oceanic Atmospheric Association (sic) with a Flesch-Kincaid score of 13.7 - suitable for college sophomores!!! Applicable documents, sample items and other states' analyses of SBAC, as well as the OEA's teacher survey regarding testing are available to the public online. However, the Oregon Department of Education does not seem to have availed itself of such.